We got our first glimpse of Rubik's World earlier this month, pitched as an "otherworldly game [that] will look and play like no other game on the market", a "collection of extremely addictive, easy-to-play puzzle games will increase in difficulty as the player delves deeper into this 3D world." Great! So... how does it play? Not a clue. Perhaps figuring out exactly what Rubik's World is is the first challenge that will "change your intellect." Yes, change your intellect. We do know, based on the original Game Factory press release, that we'll be "constructing 3D shapes and objects, navigating through mazes and even creating [our] own soundtracks" and we'll "step inside the mysterious '27th part' of the Rubik's cube." The two screen shots we've seen so far, however, don't really help us sort out the mechanics. It's kind of pretty though! In a blocky sort of way. There are Nintendo DS and Wii versions, each with their own unique capabilities—you can sample sounds in the DS version to create music and share screens of your creations in the Wii version—but we will have to go hands-on before we can mentally break the whole thing down, we think. Here's an updated fact sheet! Step inside the mysterious "27th part" of the Rubik's cube-and discover an abstract world of Rubik's themed puzzles to tease and challenge. 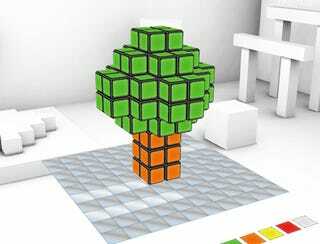 Welcome to Rubik's World- An abstract environment populated by "cubie" which make up the game's DNA. Rubik's world takes the shape, functionality and concept behind the famous Rubik's Cube but twists and turns the rules to transform it into a unique game experience for players of all ages. Get ready for a collection of games that will change your intellect while incorporating the mental twists and moves that made the original Rubik's Cube such a hit! *Play 8 unique games (Different from the DS Version) which mix puzzles, quizzes, music and sound activities- as well as the classic cube solving game! *Multiplayer mode lets you share the fun with family and friends. Compare your game stats and progress, share creations, music compositions and more! *Crisp and light color palette creates a unique look and feel. The construction of the games will challenge your brain, enable you to solve increasingly difficult puzzles, develop your logical capabilities- While having lots of fun! So take a trip inside the Rubik's Cube and enter an abstract world of Rubik's themed puzzles each as addictive as the original cube we know and love!